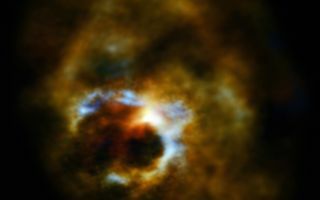 This spectacular space wallpaper by ALMA reveals Mira’s secret life. Studying red giant stars tells astronomers about the future of the Sun — and about how previous generations of stars spread the elements needed for life across the Universe. This spectacular space wallpaper by ALMA reveals Mira’s secret life. Studying red giant stars tells astronomers about the future of the Sun — and about how previous generations of stars spread the elements needed for life across the Universe. One of the most famous red giants in the sky is called Mira A, part of the binary system Mira which lies about 400 light-years from Earth.